As many of you know already from My October 2015 Monthly Favourites (and if you're following me on my twitter and my instagram then you're probably seen the posts), I started Slimming World and since starting I've had so many questions sent to me asking me all about it. 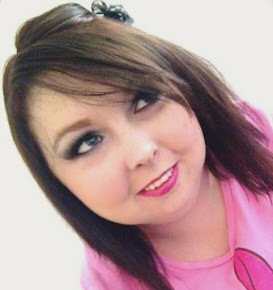 After being sent over a hundred of sometimes the same question I decided that I would do a blog post telling you all about My Slimming World Journey [so far] and answering some questions that I've been sent. I joined Slimming World on Tuesday 13th October 2015, and I am so glad that I pushed my anxiety aside and made myself go as I was so nervous. Before I went I really thought it was going to be like walking into a new school half way through the school year with everyone knowing each other and everyone having their own little groups of friends etc. I was very, very wrong and I really wish that I would never of thought that about Slimming World groups as I know if I didn't think that I would have made myself start a lot sooner than I actually did. I wanted to join Slimming World because since being pregnant with my daughter I had put on so much weight, I went from a size 12 to going on a size 18 and I really didn't like it. I want to state now that I loved being pregnant as I had the "pregnancy glow" and when I was no longer pregnant and my glow went I was gutted, also I want to make clear that there is nothing at all wrong with being a bigger sized woman, or having curves, or anything at all like that - but for me personally, standing in height at only 5foot 1inch, I wasn't used to that and I wanted to go back to the size I started at before being pregnant. Where I live in Prescot we get a newspaper through the door every month telling us about all the things that have been happening in our area and I noticed an advertisement about Slimming World so I searched online where the nearest group was (which is about 2 minutes by car) and called them. I won't say where the group was held or what the members name was but the phone call didn't go very well in my opinion the Slimming World leader basically told me that they didn't think I needed to be on Slimming World I should just be on a diet plan from the hospital due to my medical situation (aka my ulcerative colitis). I was really upset by this and I didn't bother with it. But me, being me, I decided to call up another Slimming World group leader and explained all about my medical health and basically just asked if I was able to join. She said of course, and I was so happy. I do have to travel for about 15 - 20 minutes in the car to get to my weekly group meetings but it's not too far for me and it really is worth it. So my first piece of advice is just because one group leader says no, don't be put off! Just call up another one. Still want to have that full English fry up? Go on then! I walked into the Slimming World group meeting a couple of days afterwards and it was so welcoming and friendly. Everyone really is lovely. I've been to two different groups since joining Slimming World as I couldn't make my usual Tuesday 6.30pm group, so I went along to a Monday 5pm group instead. Again, I did think that because I didn't know anyone that I would end up sitting on my own but it really isn't like that at all. I love going to my Slimming World group. Since I started Slimming World I've lost 6lb in total [so far] and that is because I limit myself to 10 syns a day. I do have a "cheat day" where I will go to 15 - 20 syns but that's only once a week which is usually a Tuesday evening after my group we will get a Chinese meal from the local chip shop or I'll have a massive hot chocolate or a Saturday night if I'm having a drink as Phil and me will have a bottle of something between us. The place where I go personally has is a Church community centre with a big hall with a stage (although we don't use that), toilets (obviously) and a small kitchen were we can make ourselves a cup of tea, coffee, juice etc. The chairs are in a semi-circle with the tables all laid out facing. I usually go in and say hello to whoever is in the room, pick a chair, a plonk myself down. Which gives me time to sort out my bag and get my things ready. We line up to pay our weekly fee of £4.95, and whilst doing so taking a look at the Slimming World magazines and books, and Slimming World bars which are available for us to buy there. My favourite so far is the Christmas 2015 book and I'm torn between the Slimming World rocky rock bars and the Slimming World lemon bars. The Slimming World bars are priced at £1.99 a box - bargain! I'm worried that people will judge me by my weight/size in group. How friendly is in a Slimming World group? So friendly! People don't understand how friendly it really is until they experience it for themselves but it's such a wonderful comforting environment. Can I lose weight while on the contraceptive pill? I have children and can't afford a baby sitter. Can I bring my kids to group meetings? You can yes. In the group I go to there is a little part of the hall in the corner where there are some toys and a football table for people's children to play with whilst group is going on. I'm on a student budget. Does it cost a lot of money? It really doesn't, it's only £4.95 a week. Can you still drink alcohol and eat chocolate on Slimming World? I feel silly going to group as I'm a size 12 and want to be a size 8 - what if they laugh at me? They won't. Honestly, everyone is different and wants different body sizes, no one at all will judge you. I'm a massive food lover. Do I have to have a minimal amount of food for eat meal? 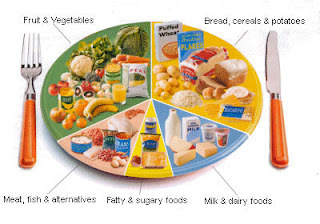 No way - you can fill your plate as much as you like. I did Weight Watchers once (or more times) and didn't enjoy it. 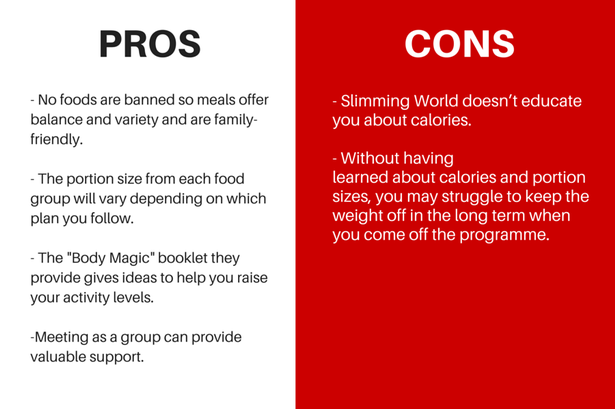 Is Slimming World the same? No. Weight Watchers is a lot more strict when it comes to eating. Do you have to be a vegan or veterinarian to join? Can vegan's or vegetarian's join? I'm a really bad cook. Does that matter? Not at all. People are always there for helping you with any advice you may need. It really isn't. You won't believe how easy it is! What actually goes on in the group? Different things on different weeks. We sit around as a group, have a chat and a cup of tea or coffee, share stories and just feel comfortable. I'm on medication. Will Slimming World still work for me? Yeah, I'm on medication and it works for me! I want to say again that joining Slimming World is a very personal discussion and that unless you are going to join and stick to it Slimming World won't worth for you. I really want to make sure that you all do know that you have to be happy with your body and size, and do not ever let anyone else at all make you feel unhappy or uncomfortable about your own body or life. Happiness about everything in your life is your own personal choice, and it is no one else's right to control your life, body or happiness. Happiness is a right, a privilege that you deserve. Every single person in this world is imperfection and imperfection is something to be very proud of. Imperfection is beautiful, and so are you. I really hope you all enjoyed reading this blog and it helps some of you out. 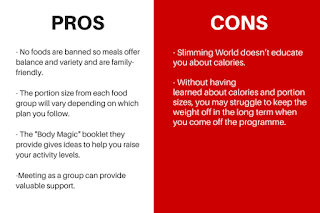 My advice is to join up to Slimming World yourself if you're thinking about it or interested in loosing weight as it's such a great thing to do, and it really does work. Maybe joining up could be a Christmas present from someone? Ask them to pay the £14.95 sign up fee for you, or you could do Slimming World as your New Years resolution for 2016? I'm so glad I've joined up and didn't leave it any longer. Might look into seeing if this is offered in Canada.